Let it be known that although I am an endurance athlete and live in Los Angeles - the epicenter of holistic eating, I am not a salad fanatic. A very common question I receive is “Are you vegan/vegetarian?” Perhaps there is such a strong connection drawn in popular culture between “healthy” and “vegan” that people just assume I eat this way in order to do IRONMANs and ultra marathons. But I eat a broad spectrum of foods, and sometimes that includes non-veggie options. With all this being said, one of the recipes that I have crafted for myself over the years (a meal that is easily a top five favorite in my mind) is not only vegetarian (with an easy vegan alteration): it is a SALAD!!! Surprise! This salad is so delicious, hearty, and packed full of flavor that it has me coming back week after week begging it to get in my stomach. I was so fortunate to come across Rubbermaid’s NEW TakeAlongs Meal Prep Containers because they are made for this salad and this salad is made for them. The only challenge I had been having with creating this salad ahead of time to take with me to training sessions was that the hot items in it were wilting the lettuce if not eaten immediately. PROBLEM SOLVED. 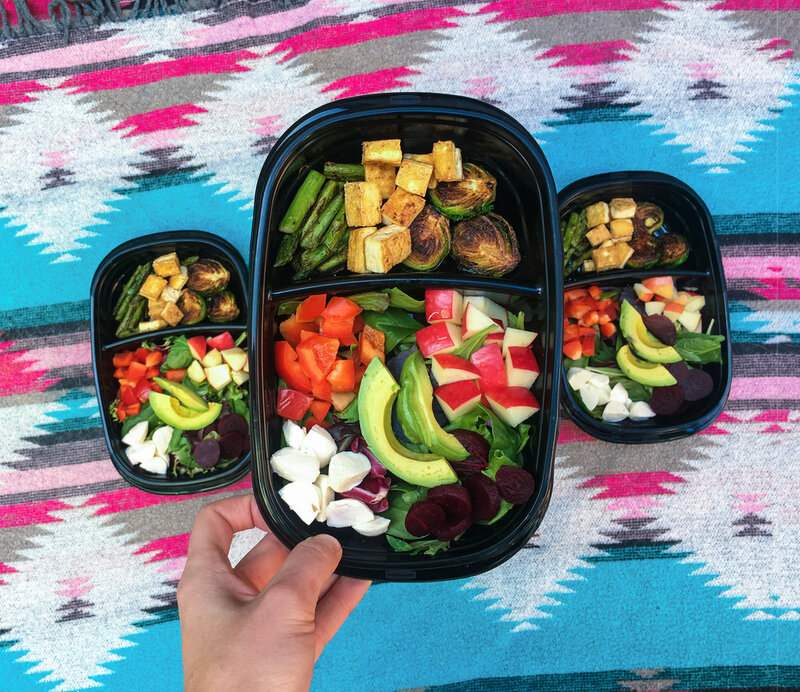 The built-in divider keeps the tasty roasted veggies (stay tuned for the full recipes) separated, preserving all the fresh goodness for eating on-the-go. The other great thing about the Rubbermaid TakeAlongs Meal Prep Containers is that they’re currently on Rollback Pricing at Walmart through 2/10/19! 2) Add halved brussel sprouts face down and allow them to roast until a medium brown and slightly crispy. Flip over and let them roast on the other side for about 2-3 minutes. Add salt/pepper to taste. Remove from pan and set aside. 3) In the same pan add in the 1 inch pieces of asparagus. To evenly roast, stir the pieces periodically so that all sides are a light brown and the stalks are soft. Salt/pepper to taste and set aside. 4) Add 1/2 inch pieces of tofu to the pan (you may need to add in more olive oil at this point, so that each piece of tofu is resting in a thin layer of oil). Allow tofu to sear for 2-3 minutes on each side. (PRO TIP: make sure that your tofu has been drained of all excess water by pressing it between paper towels before cutting it) Once the tofu is crispy and a golden brown color on both sides, remove from pan and set aside. 5) You can prep your cold items before or after the pan-roasted items. The apples/red bell peppers need to be diced into small chunks and the beets/avocados need to be sliced. Lastly, the mozzarella balls should be halved (not necessary, just something I find makes the food sit nicely on the lettuce). 6) Once you have all your items prepped, take out your TakeAlongs Meal Prep Containers and add the mixed greens to the larger section of the trays. Portion the beets, peppers, apples, cheese, and avocados into the four corners of the tray on the bed of lettuce (I like to put the avocados in the middle, but dream big if you must). 7) Add the hot items to the smaller section of the tray (the tofu, asparagus, and brussel sprouts). *There should be just enough room to add a small dressing container on either side of the divider. Enjoy! Let me know how you like it. And if you end up making it for your weekly meal prep, take a picture and tag me in it!